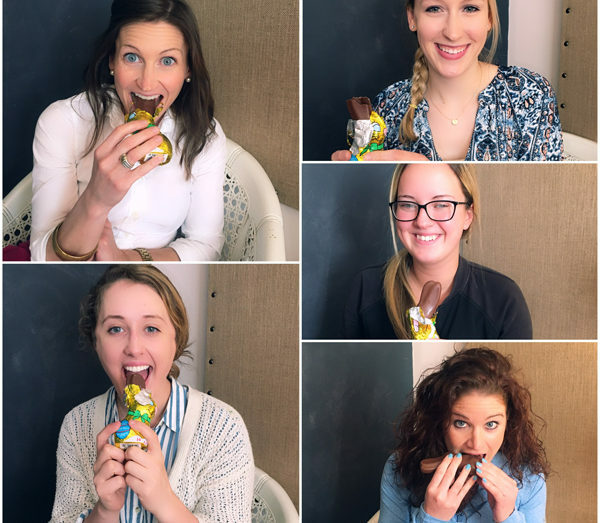 Clairemont Communications | How Do You Eat Your Easter Bunny? How Do You Eat Your Easter Bunny? With Easter just a few days away, we’re whipping out sweet treat trivia in the Clairemont office. According to a study by the National Confectioners Association (NCA), 89 percent of survey respondents eat their chocolate bunnies ears first. Five percent eat the tail first, and 6 percent go for the feet. We’re all about some solid research — especially when it comes to chocolate. (We even have a chocolate factory as a client!) So we gave these stats a test run with the Clairemont team. Research shows that we fit the bill! Four out of the five Clairemont team members polled went for ears first (except for Cherith, who wanted to buck the trend).